Hamilton was introducing new models all the way up until the final days of US production in 1969. One of the models introduced in the the 1968 / 69 season was the Accumatic A-508. It was produced for only these two years. Well, after about 360 posts to the blog, I've gotten to be pretty good at guessing what sort of model an automatic is likely to be. It looks like an Accumatic and the since it comes in a stainless steel case, it's likely to be a 500 series. If it was gold filled it would be a 400 series, unless it had a stainless back, then it would be a 450 series. Get it? Of course, I would still need a reference to know that it's a 508 and not a 501, 2 or 3, etc. 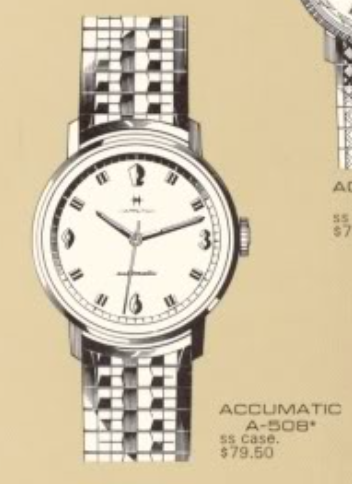 Tucked below the white dial is a Swiss-made ETA-based Hamilton 689A... a 17 jewel automatic model. My A-508 project watch came with it's original bracelet, made by Kreisler. It wasn't running though. The 689A is a frequently used movement in the Accumatic line. The earlier models often used the 689 - which is very similar with some minor differences here and there. This one has some wear to the rotor carrier (near the partially worn word "Unadjusted". The case back has a rub mark too. Close inspection while removing the dial revealed that one the dial foot screws was missing... I suspect the movement was slightly loose in the case. I found the missing dial foot screw under the balance - which explains why the watch wasn't running. After completely disassembling everything and ultrasonically cleaning all the parts, everything is ready to be put back together. The trickiest part of reassembling this style of movement is to get the center wheel, third wheel, fourth wheel and escape wheel all lined up at the same time so the train bridge will drop into place. This is one of the unique situations where the "center wheel" isn't in the center at all. It's actually off to the side. The fourth wheel is in the center though - as it drives the second hand. Now that all four wheels are installed, I can put the pallet fork in place. Installing the wheels without the pallet fork allows me to see if the wheels will spin together - that means everything is lined up right. In this shot, the movement is back to running condition, as shown by the blurred balance wheel. The center wheel jewel is the one nearest the top of the photo... it's technically the furthest from the center, making it more of a second wheel than a center wheel. The mainspring barrel is the "first" wheel", by the way. Putting the running watch on the timer, it's running with a good beat rate but the beat error is a little high - especially since I can easily adjust it on this movement. There... a beat error of 0.1ms is just about perfect. The amplitude is a little low, but I didn't fully wind the movement yet. A new crystal completes the restoration of this very attractive A-508. With the original bracelet, it now looks and runs good as new.